Monument in memory of those killed in Tlatelolco in 1968 (erected October 2, 1993). This new Electronic Briefing Book on the Tlatelolco massacre is based on a collaboration between Proceso magazine and the National Security Archive and launched on March 2, 2003. The collaboration grew out of a shared desire to publish and disseminate to a wide audience newly-declassified documents about the United States and Mexico. On an occasional basis, Proceso magazine publishes an article by the Archive's Mexico Project director, Kate Doyle, examining new documentary evidence on a chosen topic. The series--called Archivos Abiertos (or, Open Archive), draws from U.S. and Mexican declassified records on a range of issues that includes, for example: foreign policy, Mexican elections, human rights cases, presidential meetings, U.S. training of the Mexican military, the role of the press, peso devaluations, and state repression during Mexico's "dirty war." On the same day that Proceso's article appears in Mexico, the National Security Archive posts an Electronic Briefing Book on its Web site, containing bilingual versions of the article, a link to Proceso's Web site, and all of the declassified documents used for the piece, reproduced in their entirety. The National Security Archive has investigated the Tlatelolco massacre since 1994 through records obtained under the Freedom of Information Act and archival research in both Mexico and the United States. In 1998, the Archive posted its first thirty declassified U.S. documents on 1968, a collection which prompted then-Congressman (now Mexico's ambassador to the United Nations) Adolfo Aguilar Zinser to call for a new freedom of information act in Mexico. At the time, Mexico was still ruled by the Institutional Revolutionary Party (PRI) and absolute secrecy continued to surround the tragedy at Tlatelolco. In recognition of the thirty-fifth anniversary of Tlatelolco in 2003, the Archive published a second briefing book on the incident, which included more than one hundred documents from the CIA, FBI, Pentagon, State Department and the White House. The collection has proven itself to be the most comprehensive set of declassified U.S. records available on Tlatelolco, and has been used journalists, historians, scholars and political analysts, U.S. and Mexican alike. Now the Archive adds to its previous postings by publishing a set of documents concerning the events of October 2, 1968, culled entirely from the recently-opened "dirty war" collection in Mexican national archives (Archivo General de la Nación-AGN). Drawing on some of the millions of records released under executive order by the Interior Secretariat, the intelligence agency "Federal Security Directorate," and the Secretariat of Defense, this posting brings together documents focused on one of the enduring mysteries of Tlatelolco: who died as a result of the ferocious violence unleashed by government forces in the Plaza of the Three Cultures? Who are the dead of Tlatelolco?Archivos Abiertos is determined to find an answer. It seems like a simple question. Who among the thousands gathered in the Plaza de las Tres Culturas on the afternoon of October 2, 1968, did not come home that night? Who fell, instead, at some dark moment, caught between agents shooting from the apartments surrounding the square and the soldiers swarming below? Who died from their wounds as a Red Cross ambulance careened through the streets of Mexico City toward some emergency room? Who succumbed days later in a hospital bed? Who are the dead? What were their names? They are questions that have haunted Mexico for 38 years. Perhaps in another place, at another time, they would have been answered simply--with autopsy and death certificates, police reports, hospital records, film and photographs, and good journalism. But Mexico was not that place, and 1968 was not that time. Mexico in 1968 was a nation of secrets and lies, where rumors trumped facts, propaganda masqueraded as news, and government officials were accountable to no one. As a consequence, today we have neither an official nor an unofficial version of the massacre at Tlatelolco that explains its enduring mysteries: What orders did the PRI-led government give its military, police and intelligence services on October 2nd? Which senior officials in the administration of Gustavo Díaz Ordaz gave those orders? Why did the shooting begin? In the face of the government's refusal to explain its role over the decades that followed 1968, others have tried: journalists, writers, the former leaders of the student movement, historians, political analysts. An independent "truth commission" convened in 1993, but failed to reach a definitive conclusion due to lack of resources, time and authority; the Comisión Especial del 68 tried again in 1998 but was stymied by the lack of evidence. Elena Poniatowska wrote her ground-breaking account in 1971, based on personal testimonies. Former student leaders, such as Luis González de Alba, have contributed important eyewitness accounts of the massacre. Sergio Aguayo established new facts in his invaluable book, 1968: Los Archivos de la Violencia. His unprecedented access to the documents of the Interior Secretariat (General Directorate of Political and Social Investigations, or IPS by its Spanish acronym) helped make his analysis the most definitive to date. And yet, no one has solved the problem of the dead. Shortly after taking office in 2000, President Vicente Fox promised to clarify the events at Tlatelolco. By naming a Special Prosecutor charged with investigating the "dirty war"--beginning with the 1968 massacre--and opening secret intelligence archives to public scrutiny, Fox appeared to signal that his government would no longer tolerate the official cover-up. "We are prepared to face the ultimate consequences in the clarification of these events," he told an audience gathered outside the national archives to inaugurate the dirty war collection. That was four and half years ago. As the 38th anniversary of Tlatelolco approaches, we wait for clarification; there has been none, to date. Last December, the team of investigators and analysts responsible for writing a definitive truth commission-style report for the Special Prosecutor's office completed its work and turned the document over to Dr. Ignacio Carrillo Prieto. When Carrillo failed to present it to the President, a draft version was leaked to a handful of prominent writers and reporters. The National Security Archive posted the draft on our Web site in order to provide broad public access to it and prod the Fox administration to publish an official version. Fox responded by promising that the final report would be issued on April 15, but the deadline has come and gone without comment from the President. How many died at Tlatelolco? Archivos Abiertos decided we should try and investigate the issue ourselves. John Rodda, a sports writer for the British newspaper The Guardian, was in Mexico to cover the Olympics when the massacre took place. Based on what he witnessed and the interviews he gathered, Rodda originally reported that 325 people died in the Plaza de las Tres Culturas. Many present in the plaza that night came to the same conclusion. Students, passers-by and residents of the Tlatelolco apartment complex told of witnessing hundreds of bodies: lying in pools of blood, stacked up against the walls of the church, or tossed into trucks that arrived after the shooting stopped to clean up mess. In the days and weeks and years following the massacre, the range of estimates of the number of victims fluctuated wildly. President Díaz Ordaz's spokesman, Fernando Garza, guessed shortly after the shooting stopped that seven people had died; hours later, he raised the number to 20. El Día counted 30 bodies. Siempre! counted 40. On October 5, the National Strike Council, which had organized the rally at Tlatelolco, said 150 civilians and 40 soldiers had been killed. "Not one," General José Hernández Toldeo told Proceso, when asked in 1978. In 1993, Félix Fuentes--who, as a reporter with La Prensa in 1968, had written a gripping first-hand account of the massacre--could only speculate: "The calculus of those killed has oscillated between 200 y 1,500." Somehow the estimate settled on 300. The number appears repeatedly: in books, editorials, articles, memoirs. I have used the number in my own writing. But without documentation, it is meaningless. "It is terrible to have arrived at a number of those killed by consensus," observed Aguayo (Los Archivos de la Violencia, 249). And by guessing at numbers without linking them to names, we confiscate the very identities of the victims of Tlatelolco: their faces, their families, their lives before they were lost. Archivos Abiertos decided to investigate the names of the victims of Tlatelolco. We spent some eight months conducting an exhaustive review of records found in the IPS, DFS and Sedena collections of the Archivo General de la Nación. Although we consulted many of the extraordinary books written about the massacre, we were determined to rely exclusively on primary documents to piece together the puzzle. Of course, documents can be misleading. Official records can contain errors and distortions, just as memory can. But read collectively and critically--and checked against secondary sources and eyewitnesses--they can also provide the solid evidence necessary for the construction of accurate history. Official records are the best weapons we have to challenge decades of official silence about the past. They also solve the problem of trying to write history "by consensus"--what Luis González de Alba critiqued as exercise of "suppositions… without facts, without research, without interviews to the contrary, without the historical and detective work that the events deserve" (cited in Los Archivos de la Violencia, 13). The decision by the Fox government to force the release of millions of military, police and intelligence files in 2002 was a watershed for openness in Mexico--and a radical break with the past. The reality of trying to obtain those files, however, and use them in an investigation is a tremendously difficult task. The collections include no index. The archivists rely on internal, unpublished rules--that seem to change frequently and without warning--to decide what to release and what to deny. The process can frustrate even the most persistent researcher to the point of defeat. There are three distinct record groups. The Dirección Federal de Seguridad (DFS) collection in the AGN's Gallery 1 includes hundreds of documents containing information gathered by the intelligence agency in the aftermath of the massacre, and numerous references to the dead. We relied heavily on the DFS records to construct our list. The release of the documents is maddeningly arbitrary, however. One day we would be told that a document we wanted to read was reserved and could not be released. Weeks later, we would receive the same document without difficulty from a different archivist. Over time, we gathered several versions of the same documents: some with pages missing, others with sections deleted, still others released in full. The inconsistencies reflect the lack of archival guidelines regulating the disclosure of information from Gallery 1. The directorate of the national archives should insist on the creation of a set of clear and defensible rules and publish them, so that archive staff and outside researchers alike will understand how to proceed. In Gallery 2, the documents of the Dirección General de Investigaciones Políticas y Sociales (IPS) from Gobernación also provided evidence on those killed at Tlatelolco. An important report by then-Attorney General, Julio Sánchez Vargas, titled "Tlatelolco: 2 de octubre," contains details from the autopsies of 15 identified people killed at Tlatelolco, and an additional ten more unidentified. Without a real index, however, the labor involved in trying to review the IPS records is immense. Researchers cannot request individual documents, but must comb through entire boxes of unorganized paper in search of relevant information. The records of the Secretariat of Defense in Gallery 7 of the AGN contain nothing pertinent to the massacre at Tlatelolco. It is clear from a review of the documents in that gallery that Sedena withheld a vast amount of documentation from the collection it turned over to the AGN. For example, "partes militares" exist that announce the deaths of two army soldiers on October 2nd, but we found them in a book published by Proceso in 1980, not in the archives. President Fox--who charged the Army as well as the Interior Secretariat and intelligence service with turning over their records of the dirty war--should demand compliance by the armed forces of his own executive order and require that SEDENA records be disclosed. We also consulted the Informe borrador del Fiscal Especial, Que no vuelva a suceder, written in 2005 with extensive use of the AGN dirty war archives. It was not a useful document. Although the section concerning Tlatelolco is eloquent and detailed in describing the student movement of 1968, it is riddled with errors and comes to no definite conclusion about who was killed on October 2nd. Among the list of the victims of Tlatelolco, for example, are people who died at student protests that took place before October 2nd (such as Román Nájera Valverde, who died in August 1968; see p. 72). Records are sometimes mischaracterized, such as a draft of the Attorney General's report on Tlatelolco, which is described as a document "apparently elaborated by the CNH [Consejo Nacional de Huelga]" (see p. 60, footnote 216). And in several cases, it was impossible to verify information used by the Fiscal's investigators because the documents have been resguardado por la Fiscalía and are no longer open to the public. Until the final version of the Special Prosecutor's report is made public, it will be impossible to use the draft in an investigation of the events at Tlatelolco. We await President Fox's decision to release it, as he pledged. Eight months after Archivos Abiertos launched our search for official records, we can now publish an initial and definitive list of the names of those who were killed at Tlatelolco. The result is surprisingly low, though no less powerful in its implications. To date, we have found records confirming the deaths of 44 men and women in the archives of the dirty war. Thirty four of the victims are identified by name. Ten more people are listed as "unknown." There may be others, but we have not yet found them in the archives or in any other official registry. We will continue to search for new evidence. What we do know is that the death of each of the 44 individuals found in the files of the dirty war is documented in more than one declassified government record. Each one is cross-checked against the secondary sources available to us. Each one represents a life lost in the senseless attack by government forces on the student movement--an attack that killed not only students but soldiers, workers, a teacher, a housewife, a 15-year old doméstica, an unemployed father. All of the government documents related to the 44 victims may be found on the National Security Archive's Web site. In the hope of identifying the ten victims of Tlatelolco that remain nameless, and other victims not yet identified in files of the dirty war, Archivos Abiertos is launching a new blog today, where friends and family members can register information, documentation, photographs and memories about their loved ones lost on October 2nd. We hope, through this electronic citizen registry to be able to arrive at a more definitive list of Tlatelolco's victims, and to memorialize those lost. To participate in the Registro de los Muertos de Tlatelolco, go to the Web site of the National Security Archive's Mexico Project and click on the link to our blog on Tlatelolco. Together, we can construct an accurate history of the events of Tlatelolco - a history based on facts as well as the painful memories that linger. …and ten more unidentified persons. Note: The documents cited in this Electronic Briefing Book are in PDF format. Report on the deaths. - Plaza "Three Cultures"
This document lists the hospitals that received those injured and killed on October 2nd. It identifies victims when possible, and lists the rest as unknown. The report mentions in particular Delegation No. 3, in which 14 unidentified bodies were found - eleven men and three women - and observes that one of the women "was noted to be pregnant." Included among those injured at Tlatelolco was the soldier Manuel Telésforo López who was picked up by Red Cross. The report indicates the grave condition in which he was found, which "probably resulted in his death." Also included in this list is information on the late Italian journalist Oriana Fallaci, who was sent to Hospital Rubén Leñero and, according to the document, refused to make a statement until she could contact her embassy. This intelligence report describes the violent clash between soldiers and government snipers during the student-led meeting at Tlatelolco, and its aftermath. Written in the early hours of October 3rd, the document says that delegations and hospitals around Mexico City were reporting 26 people dead, including four women and one soldier, "the majority of which have not been identified…" The document also reports 100 people wounded and over one thousand detained. This is a summary of the aftermath of the violence at Tlatelolco. The intelligence report discusses the decision by doctors in Mexico City to strike in response to the repression; the funeral of Gilberto Reynoso Ortiz, one of the young students killed on October 2nd; and contains a list of the names of 18 others who died. The report also mentions the deaths of three people injured on October 2nd who died two days later as a result of their wounds, two soldiers whose names are not given, and eight unidentified victims. The first four pages of this document were withheld by the archivist in Gallery 1. This document relates the arrival of the body of engineering student Carlos Beltrán in his home state of Sinaloa. According to the report, Beltrán's father, Jesús Beltrán Valenzuela, sought to take the body to the family's home rather than to the University of Sinaloa or into the hands of students. This document describes the declaration made by Sócrates Campos Lemus before the Public Ministry and discusses student rallies and other reactions to the violent incidents of October 2nd. The report also contains a reference to 18 year old Bertha Corona Tafoya, who died from wounds sustained at the Plaza of Three Cultures. This report contains a list of 42 people who were killed during the student movement of the summer of 1968. Although the document is dated 16 October, the last person mentioned was injured October 2nd and died on the 27th of the same month. Every name contains information about the victim. In most cases, the report lists the victim's profession, as well as the cause, place and date of death. Some entries include references to the friends and relatives who identified the body, and the victim's home address. This letter, signed by the Director of the Medical Forensic Service of the D.F., Dr. Miguel Gilbon Maitret, is a response to a request made by Attorney General Julio Sánchez Vargas regarding the causes of death of 26 people at Tlatelolco. The report describes the trajectories of bullets that struck the 26 victims, noting that most had been hit horizontally [presumably as a result of gunfire between soldiers in the plaza, rather than shots coming from snipers posted above in apartments]. The Director of Federal Security, Gutiérrez Barrios, discusses the reaction of the medical community to the acts of October 2nd, reporting on the posting of anti-governmental language appearing in hospitals in Mexico City. The document includes a final note about Melitón Pérez Vitel, who died from wounds sustained during the events at the Plaza of Three Cultures. This intelligence report describes student assemblies of High Schools (Vocacionales) 1, 2, 3 and 4 held after October 2nd, and their decision to continue striking in response to government repression. In Voc. 1, students petitioned to name the school auditorium after Guillermo Rivera Torres, a student from that high school who died at Tlatelolco. Report on those who were killed or injured on 2 October 1968, during the events that occurred in the Plaza of the Three Cultures of Santiago Tlatelolco. This report contains a list of 28 people killed and 51 injured on October 2, 1968. In many cases it contains the occupation and the age of the person listed. This report describes a meeting held to discuss the events of Tlatelolco, held in the Escuela Nacional de Maestros. During the meeting, students called the army and police "assassins of the people," and observed a minute of silence in memory of one student, Juan Rojas Luna, who died on October 2nd. The gathering was interrupted by students from the Instituto Politécnico Nacional and the Preparatoria Popular protesting the weak response by student associations to the events of Tlatelolco. This is a legal complaint filed by members of the student-run National Strike Council (Consejo Nacional de Huelga-CNH) with the Attorney General on 20 November 1971. 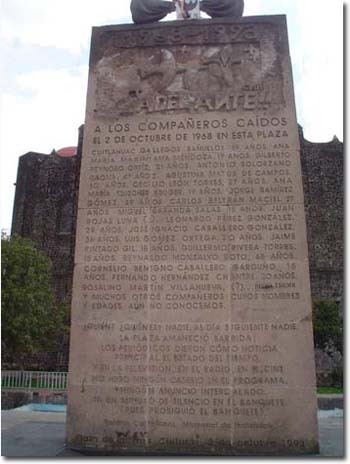 It contains a list of "some of the victims of the Plaza of the Three Cultures in Tlatelolco, 2 October 1968," naming 27 people who were killed during the incident. The report also provides testimony from 63 witnesses. This is the final 130-page report known as the "Blue Book"--written by the Mexican Attorney General, Julio Sánchez Vargas--regarding the events of Tlatelolco. The report contains information from the autopsies of 25 people who died from bullet wounds on October 2, 1968. Ten of these individuals are listed as "unknown." The details of the autopsies are of great importance because they describe the entry and exit wounds sustained from the bullets, establishing "irrefutable evidence [of] the origin and direction of the shooting…which, if it does not lead to the identification of the gunman, certainly provides the precise location of the shooter in relation to the victim." The report also provides pictures of the Plaza de Las Tres Culturas, with diagrams displaying the bullet trajectories as deduced from the information provided in the autopsy reports. This extract concerning the events of October 2 comes from the Special Prosecutor's draft report posted on the National Security Archive website in February 2006. The report describes the student movement during the summer of 1968, and the circumstances of the violence that broke out during the rally at Tlatelolco. It contains a provisional list of students who died during the meeting, although there are errors in the names and sources. This extract of the final report of the Mexican Special Prosecutor concerning the events of October 2 is very similar to the draft report made public in February 2006. It derives the same number of deaths from Mexican police, military and intelligence files (32), and continues to maintain that evidence does not exist to establish a definitive list. The final report also contains the same mistakes as the draft, such as the mischaracterization of the Julio Sánchez Vargas report (Document 13) as the product of the National Strike Council (CNH), and the inclusion of names of students who in fact died before October 2nd. One notable difference, however, is the final report's omission of reference to documents held by the Special Prosecutor's office in internal file folders, or Carpetas, which were used by investigators. The omission of the reference leaves researchers wondering if the documents will ever be returned to the Mexican national archives, or if they will remain permanently where they are now: under seal in the Office of the Attorney General. LISTA DE TARJETAS CONSULTADAS PARA SACAR LA ESTADÍSTICA DE MUERTOS DURANTES LOS ACONTECIMIENTOS DEL 2 DE OCTUBRE DE 1968. 5) HOSPITAL DE TRAUMATOLOGÍA "RUBÉN LEÑERO"
14) DIRECCIÓN GENERAL DE INVESTIGACIONES PARA PREVENCIÓN DE LA DELINCUENCIA. a) Tercera Delegación de Policía. b) Novena Delegación de Policía . 1.- Aguayo, Quezada, Sergio, 1968. Los Archivos de la Violencia, México, Grijalbo: Reforma, 1998. 2.- García Medrano, Renward, El 2 de Octubre de 1968, México, Rayuela Editores, 1998. 3.- Campus Lemus, Sócrates A., 68.Tiempo de Hablar, México, Sansores y Aljure Editores,1998. 4.- Poniatowska, Elena, La Noche de Tlatelolco, México, Editorial Era, 1971. 5.- Farías, Luis M, Así lo Recuerdo, Testimonio Político, México, Fondo de Cultura Económica, 1992. 6.-De Mora, Juan Miguel, T-68. Tlatelolco, México, Editores Asociados, 1973. 7.- Varios Autores, 1968. El Principio del Poder, México, proceso, 1980. 8.- González de Alba, Luis, Los Días y los Años, México, Editorial Era, 1971. 9.-Zermeño, Sergio, México: Una Democracia Utópica. El Movimiento Estudiantil del 68, México, Siglo XXI, 1978. 10.- Varios Aurotes, Momentos Clave de Nuestro Siglo, México, Grupo Editorial Planeta, 1998. 11.- Revueltas, Andrea y Cheron, Philippe, José Revueltas y el 68, México, UNAM, 1998. 12.- Poniatowska, Elena, Fuerte es el Silencio, México, Editorial Era, 1980. 13.- García Cantú, Gastón, Javier Barrios Sierra. 1968, México, UNAM, 1998. 14.- Sevilla, Retana, Tlatelolco. Ocho Años Después, México, Editorial Posada, 1976. 15.- Cazés, Daniel, Crónica 1968, México, Plaza y Valdés Editores, 1993. 16.- García Pineda, Cuauhtémoc, Testimonio de la Verdad (Tlatelolco 68), México, Editorial Claz, 2002. 17.- Jardón, Raúl, El Espionaje Contra el Movimiento Estudiantil, México, Editorial Itaca, 2003.